In 1983 we set off on the holiday of a lifetime, three weeks in Malaysia. We visited my sister-in-law who was teaching English in Taiping, this was fantastic as she knew how to get around, could speak the language and took us to eat in some fantastic places. Highlights of our culinary adventure were Roti Canai (pancake with curry sauce) for breakfast, a steamboat (stock bubbling in a pot over a charcoal burner, with seafood and vegetables you cook in it yourself) in a Chinese Malay restaurant, chilli crabs burning our fingers and lips on Pankor island and Nasi Goreng (fired rice) eaten cold as a picnic in the jungle national park, Taman Negara. One of the first meals we ate out in Taiping was Satay, cooked at an open air street stall and charged by the stick! I'd never seen anything like it (remember it was 1983) and it tasted so good. Inevitably I came home with a cook book "Traditional Malaysian Cuisine". 1. Cube the chicken meat, drain and put aside. 2. grind coriander, cumin, turmeric, peanuts, salt and sugar. Mix this with the powdered cinnamon, diced shallots and 1tbsp oil. 3. Marinade the chicken in this mixture. 4. Using wooden skewers soaked for at least an hour in cold water, skewer 5 pieces of chicken on each skewer. 5. Grill over burning coals or under a hot grill, constantly sprinkling oil on the meat using crushed lemongrass. 6. Turn over and continue grilling until the chicken is cooked. 7. Serve with peanut sauce. 1. Grind the peanuts. put aside. 2. Grind lemongrass and ginger until fine. 5. Add in the tamarind juice and lastly peanuts, sugar and salt. Simmer until the gravy thickens. 6. To serve, arrange a few sticks of satay on a plate and serve with a bowl of peanut sauce, cucumber and sliced onion. Satay also goes very well with rice. 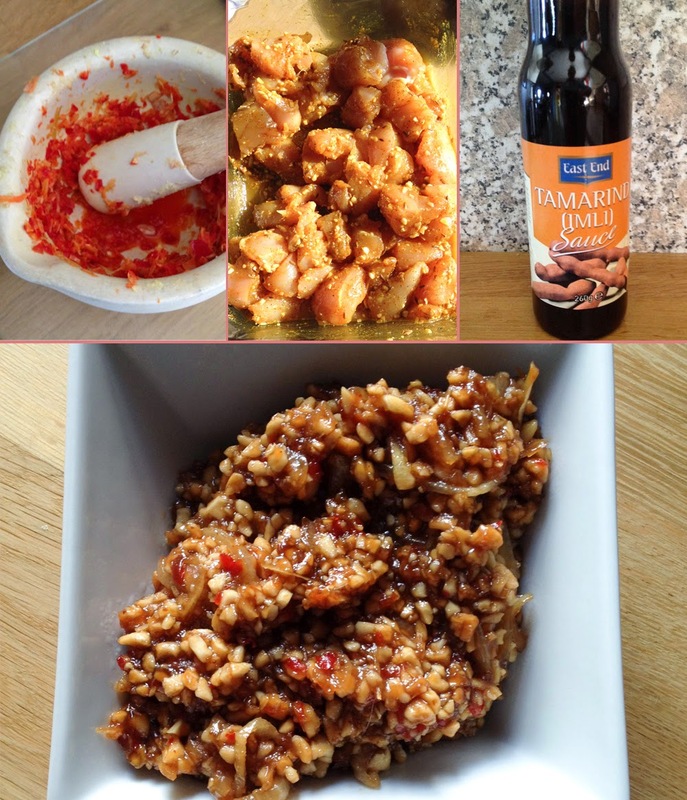 Pounded chillies, marinating chicken, tamarind sauce and peanut sauce. I fried off some of the onions from the marinade before adding the rice, then double the volume of stock to rice. This made a tasty savoury pilaff to accompany the satay. It didn't disappoint, the flavours and textures compliment each other perfectly. 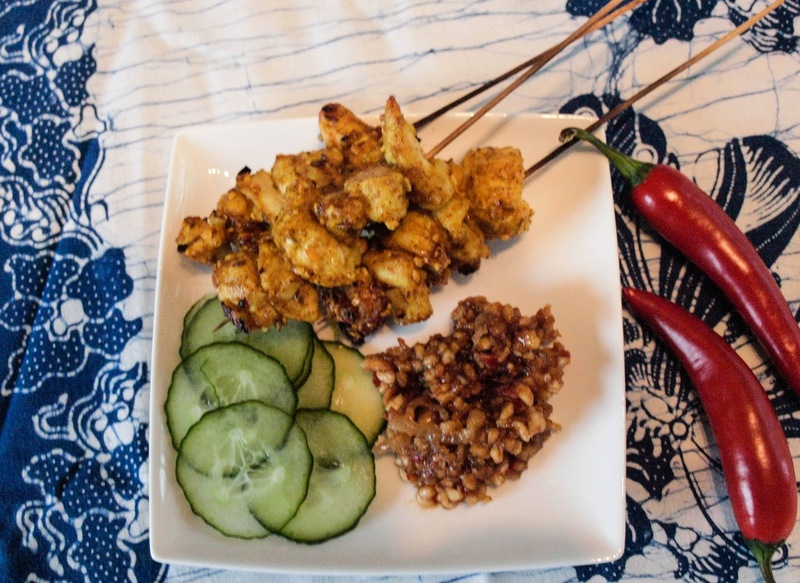 If you haven't tried making Satay yourself, I hope you can see that it's really not too difficult and have a go! That is a wonderful recipe to choose. I love it, especially the peanut sauce. That's really good. Thank you for joining us this month, Janice. I thought that first paragraph was going to end with... 'and we never came back'.... ahh, it's been too long since I had a decent satay. I love the stuff and it makes an amazing sauce to spread over potatoes before you roast them!... your chicken looks bloody marvellous! Yeah, well that would have been a good story, but I don't think I'd want to live there. Never thought of spreading the sauce on potatoes, that would be really something. I have really just discovered Malaysian cuisine and so far I have loved it! Delish! I spent a few months in Malaysia in my twenties & remember the food being fantastic. Love the look of your peanut sauce, such yummy flavours. I like the word Kajang, it's like ka-boom. Sounds delicious! What a fabulous trip to make Janice - must have been so exotic. Love satay and it must be about time I made some again. Dom's idea for potatoes sounds rather grand. 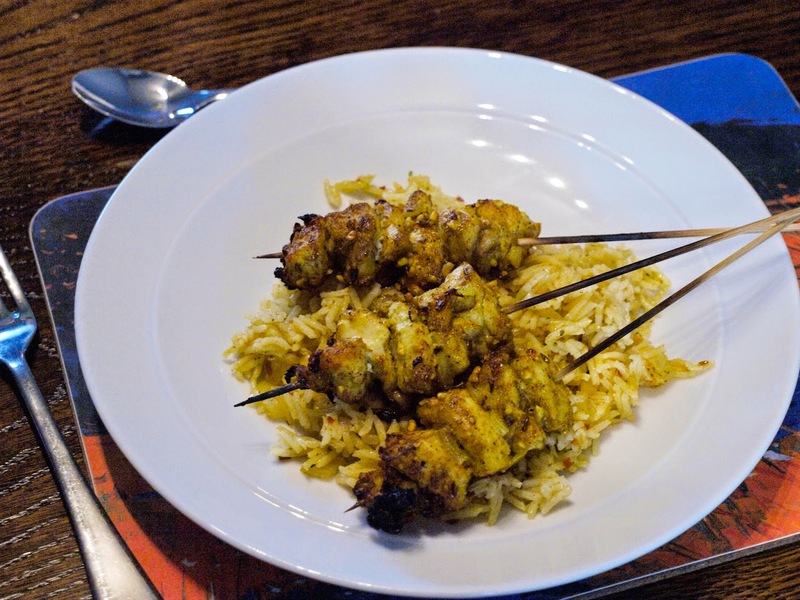 The satay sticks look so delicious, I do love satay sauce but I have not made in far too long! Think I vaguely remember making it years back on a cookery course... I have tamarind paste so think I can substitute it well..